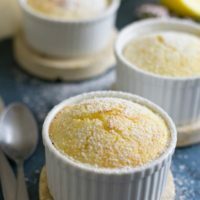 These creamy gluten free lemon sour cream cakes are light and fluffy, and full of fresh lemon flavors. Just like a souffle. Dip a fork in and savor every bite as it melts in your mouth! 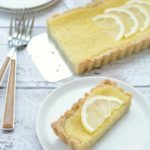 If you love lemon as much as we do, you will want to check out all of the delicious Gluten Free Lemon Desserts on the blog! 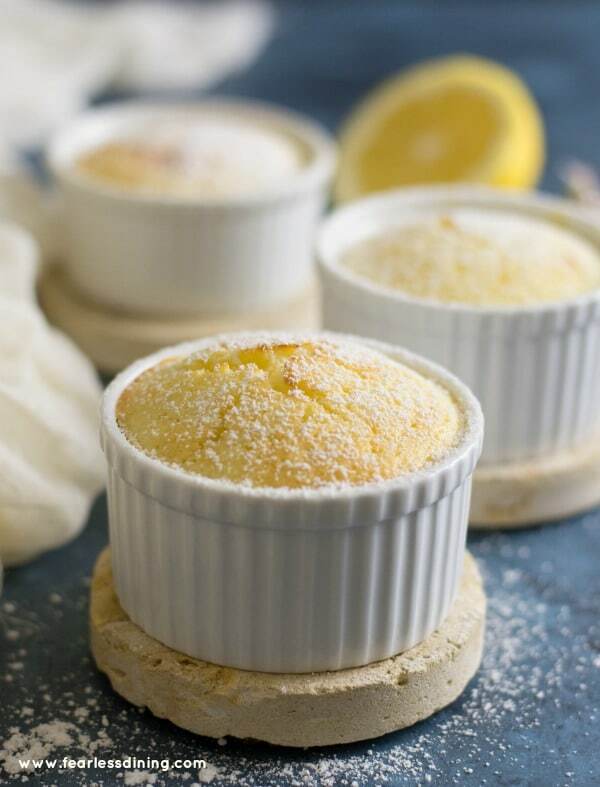 You are going to love these delicious moist gluten free lemon sour cream souffle cakes. Our lemon tree is full of lemons again. If you have read my blog for some time, you will know how much of a struggle it is to use up fresh lemons. All of our neighbor’s trees are also full, so it is hard to find people to give lemons to. If we don’t pick them fast enough, the lemons get so heavy branches break off. If you missed these stories, check out this Gluten Free Lemon Bundt Cake or Gluten Free Lemon Donuts recipe. 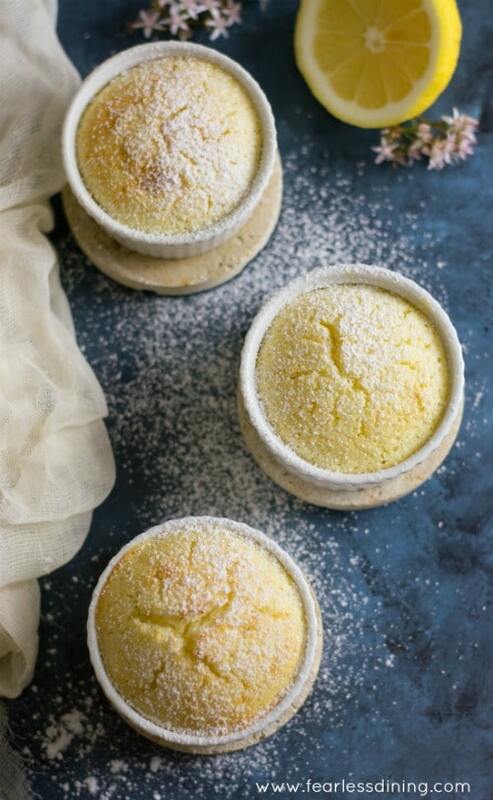 These little lemon cakes hover somewhere between a gluten free pound cake and a souffle. I guess that is mostly because they are buttery and moist like a pound cake, but they also have a lot of fluffy characteristics of a souffle. Making this gluten free lemon sour cream cake recipe is so easy. 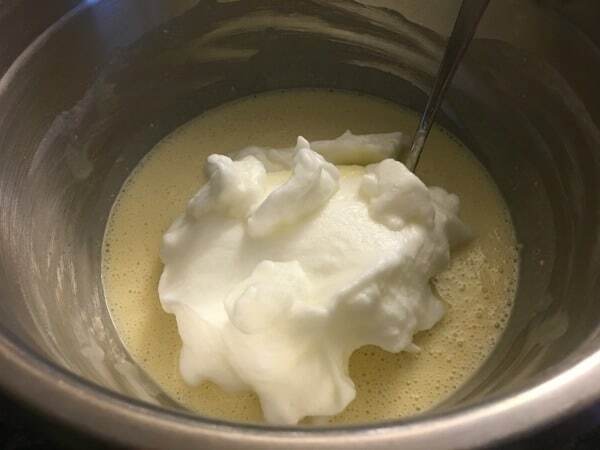 Mix up your lemon cake batter, then gently fold in the whipped egg whites. These cakes rise up like souffles when you bake them, but surprisingly, they don’t fall too far down as they cool. Allow to cool and dust with powdered sugar, or top with a fruit sauce like this delicious Olallieberry Sauce. Souffles are like clouds. They puff way up as they bake, then slowly fall back down as they cool. 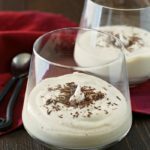 You can even check out how fun souffles can be savory too! This recipe for Gluten Free Broccoli Cheese Souffles has really easy to follow directions on how to make a souffle! You can also try this dairy free Pumpkin Spice Souffle, which is perfect for fall. Whip up your egg whites until they form stiff peaks. Pour the egg whites into the lemon batter. Fold the egg white in gently to keep these light and fluffy! These gluten free lemon fruitcakes are perfect every time! 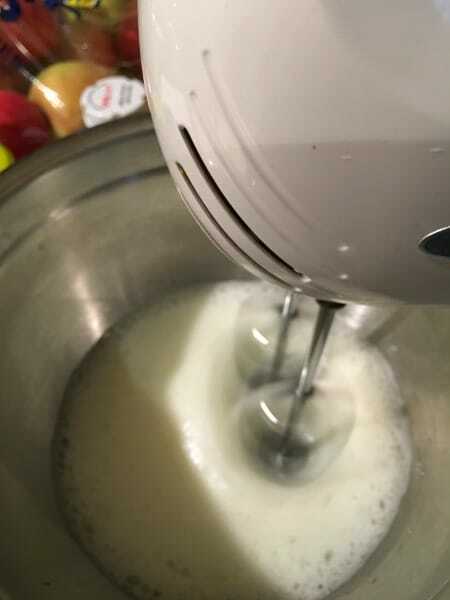 Electric mixer to whip your egg whites. Ramekins to fill with the lemon batter. Lemons, preferably from our tree :-). You can also make this lemon sour cream cake recipe in a bundt pan for a large cake. Delicious moist and creamy lemon sour cream cakes. In a large bowl, add sugar and flour and whisk to blend. In a medium sized bowl, whisk egg yolks with the butter. In a medium sized bowl, add milk, sour cream, lemon juice and zest. Whisk. Pour the lemon mixture into the egg yolk mixture and whisk. In another medium sized bowl, add egg whites. 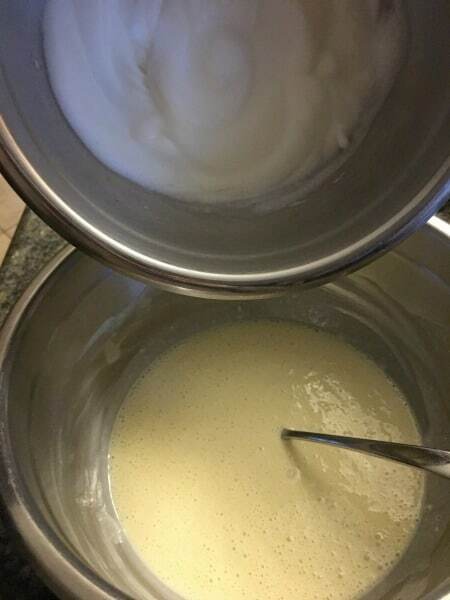 Mix on high speed until they form stiff white peaks. Gently fold this into the lemon mixture. Spray ramekins with coconut oil. Pour batter into each ramekin. Fill a baking dish with hot water about 1 inch deep. This will prevent the cakes from cracking. Add the ramekins to this dish. Bake for 20 minutes and check them. Mine cooked in 24 minutes. When done, remove carefully from the oven so you don't spill the hot water. Cool then dust with powdered sugar, or top with fruit. Are these eaten hot or cold and will they keep a day or so? Hi Shelly, we eat them room temperature, but if you refrigerate them, they will be delicious and keep for 2-3 days. 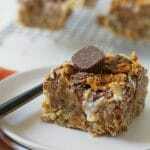 Going to try this recipe tonight! Love everything lemon!! They look delicious! The recipe does not say how long to bake the cake in the ramekins. How long do they bake and also what baking time would the bundt pan version cook as well? Hi Cinnamon, Thank you so much for your note. You are right! I had the time in the cook time, but not in directions. Mine cooked for about 24 minutes in the ramekins. For a full-sized bundt cake I am guesstimating about 40 minutes? I haven’t used this recipe in that size pan. If you do try it, please come back and let us know :-). Your description is totally making my mouth water! 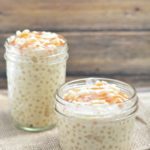 I love the step-by-step directions too – can’t wait to give this amazing recipe a try!! Thank you Adrienne…wish you lived closer so I could give you lemons from our tree. Oh yum, those look and sound so good, I look forward to trying them! I hope you enjoy Kimberly :-). I hope he has a great birthday Laura :-). I LOVE a good souffle! These ones came out beautiful, nice work! I love lemon desserts. There is something about the tart and the sweet that makes it taste so fresh. I love lemon anything, and I wish we had a lemon tree here. This is definitely my kind of dessert! If you lived closer, I would definitely share lemons anytime. Having too many lemons sounds like a fantastic problem to have! 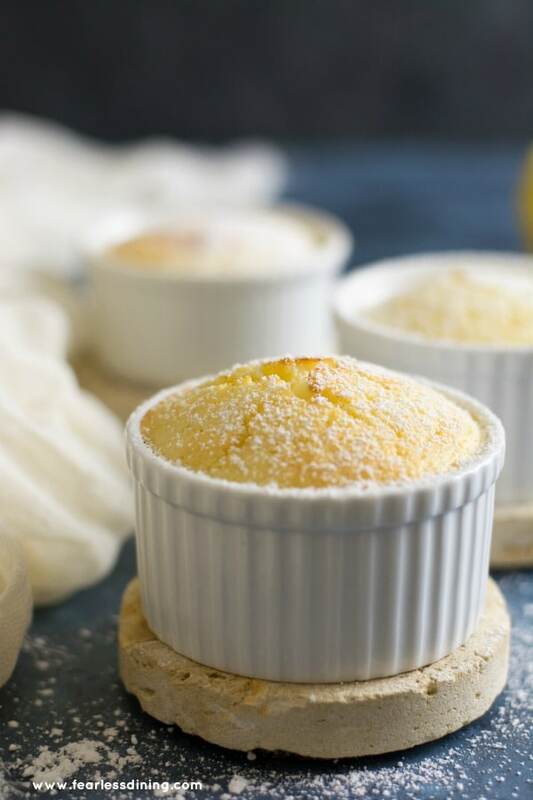 🙂 This pretty souffle looks like the perfect way to use up some of them. If you lived closer, I could keep you supplied in lemons all year long :-). 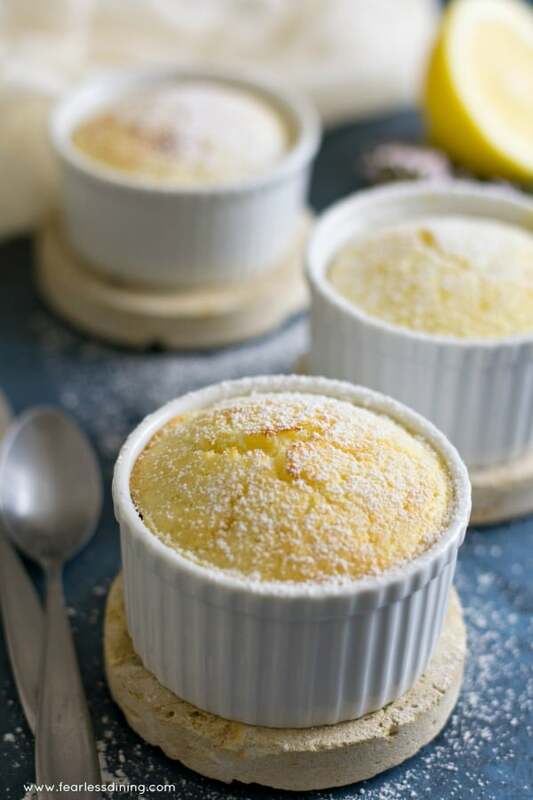 Lemon desserts are my favorite next to chocolate 🙂 Delicious! I am the same way :-).